The number of cars on the world’s roads will grow from one billion now to four billion at midcentury, Ford Motor Company Executive Chairman Bill Ford told the 2012 Mobile World Congress in Barcelona during his keynote address Monday. Ford said his company’s “Blueprint for Mobility” will seek solutions for a problem that is already a reality in expanding vehicle markets around the world. In Sao Paulo, Brazil, traffic jams can exceed 100 miles in length and the average commute lasts between two and three hours a day. Still, car buying is growing at a rate of 7.5 percent annually. 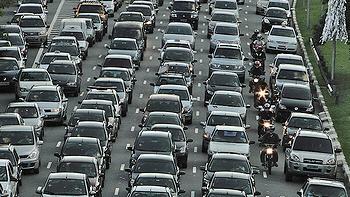 In China, the world’s longest period of gridlock was registered at 11 days during 2010. It is estimated that the cost of congestion to the economy in England through lost time will rise to around US$35 billion annually by 2025. Ford said that solving the issue of urban mobility is a huge challenge that will only be successful if government collaboration, infrastructure development and industry come together globally. “If we do nothing, we face the prospect of global gridlock, a never-ending traffic jam that wastes time, energy and resources and even compromises the flow of commerce and health care,” said Ford, the great-grandson of legendary founder Henry Ford. One solution is to create a global transportation network that utilizes communication between vehicles, transport infrastructure and individual mobile devices. “No one company or industry will be able to solve the mobility issue alone and the speed at which solutions take hold will be determined largely by customer acceptance of new technologies,” he said. Ford said personal vehicle ownership in cities is becoming increasingly impractical and outlined his vision of a different transportation landscape. He envisions a network where pedestrian, bicycle, private car, commercial and public transportation traffic have become an inter-connected to save time, conserve resources, lower emissions and improve safety. 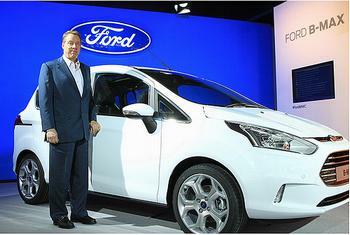 In Barcelona, Ford introduced the new B-MAX, the first vehicle ever unveiled at the World Mobile Conference. The B-MAX engine range offers as much as much as 15 percent more economical motoring with class-leading fuel economy and CO2 emissions available on both the 1.0-liter EcoBoost petrol engine and 1.6-liter TDCi diesel engine. The Ford B-MAX will make its automotive show debut at the 2012 Geneva Motor Show in March and go on sale later this year. The B-MAX features SYNC, a new safety technology. The voice-activated, in-car connectivity system allows occupants to call direct to emergency services in the event of a crash. The activation of an airbag or the vehicle’s emergency fuel pump shut-off prompts the vehicle to make an emergency call, using a pre-recorded message, through the occupant’s Bluetooth-connected mobile phone. The message is transmitted in the appropriate local language based on the GPS coordinates of the vehicle. SYNC can also read aloud incoming SMS text messages from compatible mobile phones. The SYNC system is already featured on four million cars in the United States. It soon will be available in more than 30 countries across Europe and beyond. AppLink, a feature which delivers voice control of smart phone apps from the driver’s seat, is being introduced globally as part of the SYNC voice-control and in-car connectivity system. Ford said his company plans to work closely with app developers around the world to provide the best services for Ford customers through AppLink.